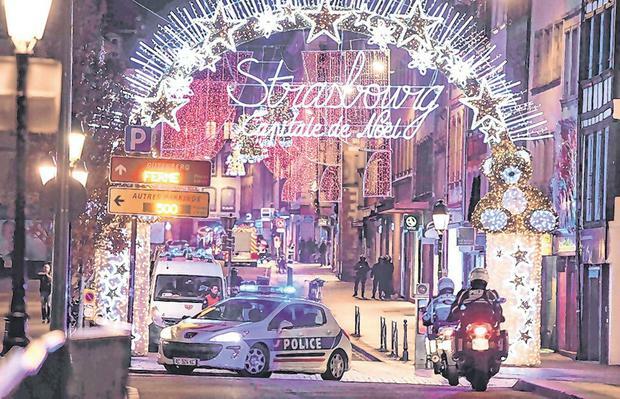 A “lone gunman” was on the run last night after killing at least four people and injuring nearly a dozen more in the eastern French city of Strasbourg, near its famed Christmas market. Shots were exchanged after a manhunt involving police and soldiers, with French media saying the gunman had already been “identified” as being on a list of “security threats”. French authorities are treating the shooting as a terrorist act. Two of the wounded were said to be in a critical condition. The gunman was initially wounded by soldiers on patrol but managed to flee, said police. Busy Christmas markets have been considered a terror target ever since a failed bomb plot in Strasbourg in 2000. The death toll, first reported as one, rose to four by late Tuesday, according to two police union officials. However, other sources put the toll at two. One official, Stephane Morisse of union FGP, said the alleged shooter was wounded by soldiers at the market. Gendarmes went to the suspect’s home to arrest him earlier Tuesday, before the attack, but he wasn’t there, Morisse said. They found explosive materials, he said. French military spokesman Col. Patrik Steiger said the shooter did not aim for the soldiers patrolling in and around the Christmas market, but targeted civilians instead. Several of the people wounded were in critical condition, the interior minister said. One witness, Peter Fritz, told the BBC one of the four people killed was a Thai tourist who was shot in the head and didn’t respond to lengthy attempts to revive him. “We tried our best to resuscitate him. We applied CPR. We dragged him into a restaurant close by,” Fritz said. The victim “is still here in this restaurant but we have lost all hope for him,” Fritz said. The French prosecutor’s office said the investigation was being conducted on suspicion of murder and attempted murder in relation with a terrorist enterprise charges, suggesting officials think the alleged shooter may have links to extremists. In multiple neighborhoods of Strasbourg, the French Interior Ministry urged the public to remain indoors. 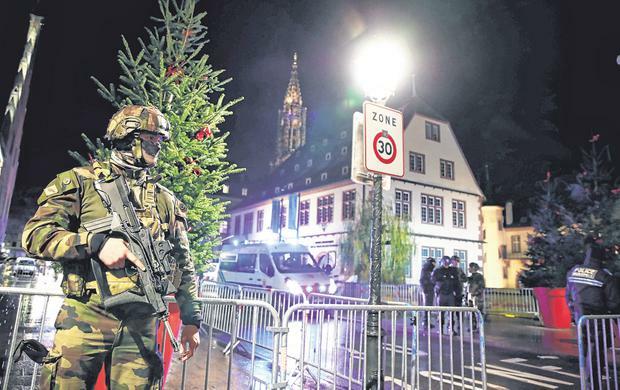 Local authorities tweeted for the public to “avoid the area of the police station,” which is close to the city’s Christmas market. Strasbourg’s well-known market is set up around the city’s cathedral during the Christmas season and is a popular gathering place. French soldiers were on patrol after the shooting. At the scene, police officers, police vehicles and barricades surrounded the sparkling lights of the market. “Our security and rescue services are mobilized,” Castaner said. European Parliament spokesman Jaume Duch said that “the European Parliament has been closed and no one can leave until further notice.” It wasn’t immediately clear how many people were inside. The attack revived memories of a millennium terror plot targeting Strasbourg’s Christmas market. Ten suspected Islamic militants were convicted and sentenced to prison in December 2004 over a plot to blow up the market on the New Year’s Eve ushering in 2000.